David Plante is an American novelist. He was born in Providence, Rhode Island, of French-Canadian and Indian descent. 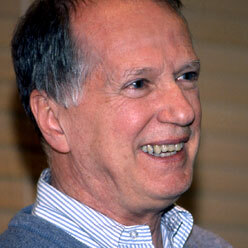 He is a 1961 graduate of Boston College and a professor of creative writing at Columbia University. He is one of the most prominent contemporary LGBTQ authors, and his novels examine homosexuality in a variety of contexts, his male characters ranging from openly gay to sexually ambiguous. Plante’s work, for which he has been nominated for the National Book Award, includes Difficult Women (1983), a memoir of his relationships with Jean Rhys, Sonia Orwell, and Germaine Greer and the widely-praised Francoeur Trilogy--The Family (1978 ), The Country (1981) and The Woods (1982). Plante has written in The New Yorker and The Paris Review. He has homes in New York and London. He has received awards from the American Academy and Institute of Arts and Letters, the Guggenheim Foundation and the British Arts Council Bursary. He was recently elected a Fellow of the Royal Society of Literature, England. Comparing ABC to Joan Didion’s Year of Magical Thinking, Tim Rutten writes in the Los Angeles Times that Plante’s novel “makes a luminous and unsentimentally consoling fictional addition to our consideration of the survivors’ lot.” Rutten notes that Gerard, the novel’s protagonist, like his creator, is steeped in the symbolic Catholicism of New England’s Francophone community. David Plante was born and brought up in a French-speaking Catholic parish in Providence, Rhode Island, that was like an isolated fortress in Yankee New England. The nuns of the parish school wore long black veils and taught the children that they lived in le petit Canada, where they preserved the beliefs of le grand Canada, a country of suffering eased by miracles. From the critically acclaimed author of more than a dozen novels comes a luminous and haunting story about grief and obsession, and about the need for meaning at the center of all of our lives.